In October 1934, Prince Henry (the Duke of Gloucester) held a function at the parks Cabaret Cave, and stayed in the Lodge we now call ‘Gloucester Lodge’. 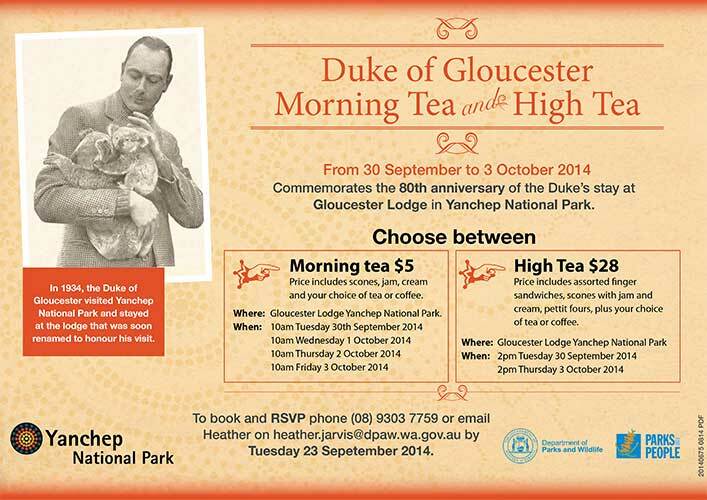 In celebration Yanchep National Park will be holding a morning tea every day in Gloucester Lodge from Tuesday 30th September to Friday 3rd October, starting at 10am. High teas will also be available on Tuesday 30th September and again on Thursday 2nd October from 2pm. 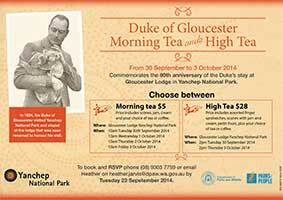 To book for the morning and high teas, contact Yanchep National Park on 9303 7759, or email Heather Jarvis at heather.jarvis@dpaw.wa.gov.au. To reserve a place for the Saturday ball, contact Heather outside business hours on 0421 776 828.